If you’re looking to travel to a city that confidently showcases the best of Italy’s vast range of offerings, then Milan city breaks are definitely for you. From designer fashion houses to Gothic architecture to an infectious metropolitan buzz, Milan knows how to look after visitors wanting to live the high life for a few days. This includes the indulgent cuisine, so let’s take a look at some of the city’s foodie highlights. Perhaps you can’t quite justify the outrageous price tags for the boutiques of Milan, so opt to eat out at designer eateries instead. Pasticceria Marchesi is the Prada owned tea rooms that serve up delectable pastries, bon bons and a variety of drinks in some seriously exquisite settings. The interior is made up of marble, velvet and tapestries along with perfectly set up window displays. Other fashionable foodie haunts include the Louis Vuitton owned Cova Caffè coffe shop and Dolce & Gabbana’s suave Bar Martini. 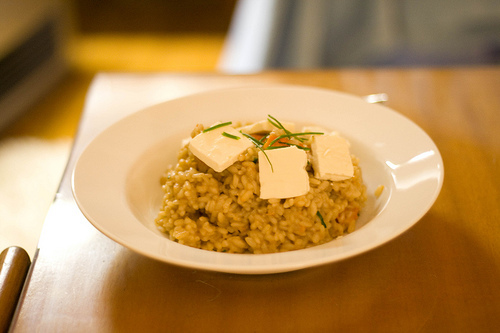 Risotto was brought to Sicily by the Arabs and made its way north to become’s one of the region’s most famous meals. At Marchesino restaurant the renowned chef Gualtiero Marchesi adds a thin layer of gold to his risotto to intensify the yellow of the saffron. Trattoria Masuelli San Marco is praised by locals and visitors alike for its traditional risotto and uses five types of meat. Find it at Viale Umbria, near Piazzale Martini and judge it for yourself whose is the best…! Milan celebrated its love of international food with the huge Expo Milan 2015 in October. 145 countries from around the world participated with their national offerings and the festival focused on sustainability and feeding the world’s ever growing population. An association called Chef-to-Chef organised a route for guests to work their way around, stopping to try bites on boats, in villages and even mountains! Local ingredients that chefs were keen to use included lots of cured meats such as coppa, salami, and pancetta. Be sure to check out details for next year’s events to coincide with booking a trip. You certainly need to take an appetite with you to Milan to fully enjoy the city. You can always walk off the calories on a tour around the city and, of course, with some shopping. Images by paularps and Lachlan Hardy used under Creative Commons License.